I was playing around with our black and white Spanish Alphabet Guided Reading Books $14.95 (or our English Alphabet Guided Reading Books $13.95) and I came up with this really cute idea. 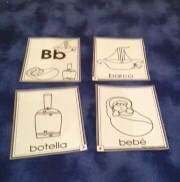 I thought that it would be a great center activity for the students to reinforce letter recognition. 1. I made a copy of the Bb book and cut it apart.I cut out the letter and the pictures on the title page because it was too big. 2. 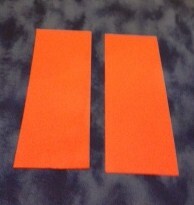 I then took a piece of 9x12 construction paper and cut an inch off to make it 9x11. I then cut in half long ways. 3. Mark one of the pieces at 4 inches from the top and fold. Mark the other piece at 5 inches from the top and fold. 4. 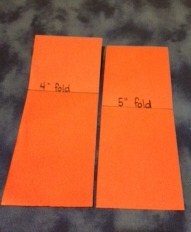 Open the pieces and place the piece with the 4 inch fold on the bottom and the 5 inch fold on top. Line up the folds and fold the pages together. Staple the pages on the fold. 5. Add pictures. Glue the front page pictures on the top layer. Glue page 2 on the second layer making sure that the word shows at the bottom when the book is closed. I had to trim the top of page 2 just a little bit to make it fit. Glue page 3 on the third layer and page 4 on the bottom layer making sure that the words show when the booklet is closed. 6. Students can try to read the words and lift the flaps to see the picture. 7. These little booklets would be great to put into a reading center or just to send home for extra reading practice.